Who doesn’t like Caesar Salad? This Grilled Caesar Salad is a twist on the traditional salad served with a lightened up dressing that is rich and tangy tasting. I still remember the first time I had Caesar Salad – I was entranced by the table side service as a garlic clove was rubbed against the wooden salad bowl, and each of the ingredients were mixed together one by one before being tossed with crunchy romaine lettuce leaves, freshly grated Parmesan cheese and fresh ground black pepper. My boys love Caesar Salad – in fact, I think most kids I’ve met willingly eat Caesar Salad over almost any other salad (or vegetable in some cases). Unfortunately, so many of the store bought Caesar Salad dressings on the market are packed with fat and other additives. Homemade salad dressings are actually very easy to make, and Caesar Salad dressing is too. It just requires a few more ingredients than the standard oil and vinegar. 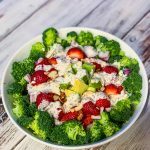 I’m always on the lookout for healthier Caesar Salad dressing recipes. 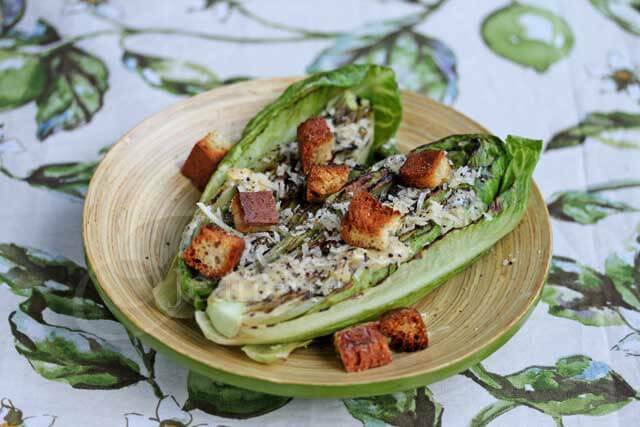 The one I used for this Grilled Caesar Salad caught my eye because it is actually cooked. The amount of dressing appeared to be far too small to dress enough salad for six people, but I was wrong. 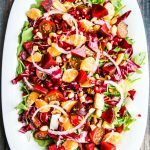 This is a lightly dressed salad, but it is not short on flavor. 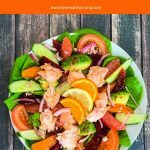 Using just 1 tablespoon of oil for six servings, it is very low in fat compared to most salads. 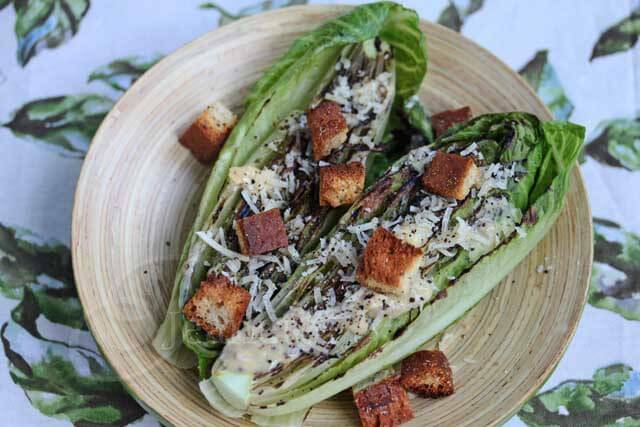 I had some fun with this Caesar Salad by grilling the romaine lettuce (I used Artisan Romaine Lettuce Hearts from Costcos – they are smaller than regular heads of romaine lettuce) ever so slightly just to get some grill marks on it. I’ve seen grilled romaine around the web but hadn’t tried it yet. Although some people brush the lettuce with oil before grilling it, I just split the romaine lettuce hearts in half and put them cut side down on the grill – no oil required. I used Artisan Romaine Lettuce from Costco's that are smaller than regular size romaine lettuce heads. Preheat broiler. Place bread cubes in a bowl and toss with 1 1/2 teaspoons olive oil, garlic powder and onion powder. Broil until lightly browned, about 2-3 minutes. Turn oven off; let bread cubes crisp up in oven using residual heat. Place remaining 1 1/2 teaspoons olive oil in a small saucepan. Add lemon juice, vinegar, water, mustard, anchovies and beaten egg yolk. Cook over medium heat until mixture thickens and beings to bubble around edges, whisking constantly. Pour mixture into a small bowl; cool to room temperature. Halve romaine lettuce hearts. Grill until browned on the cut side and leaves are slightly wilted. Remove to serving platter. Drizzle Light Caesar Salad Dressing on top. Sprinkle with Parmesan cheese and freshly ground black pepper. Dressing adapted from Cooking Light. 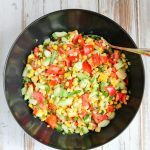 This is a fabulous looking salad…perfect for these hot salad days of summer! 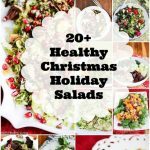 Thanks Kathy – I eat salad almost every day during the summer – great way to stay hydrated and get lots of greens. 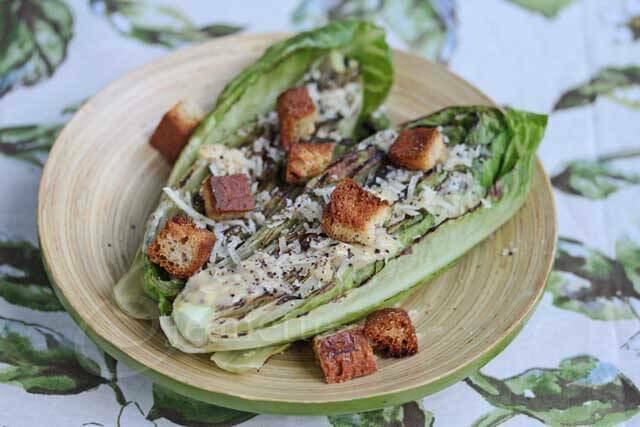 I have never had a grilled ceasar salad but keep seeing great recipes for them including this one! I am going to have to try this out this summer–it looks wonderful! Julia – I’d seen grilled salads around too so I’m glad I finally got around to trying it. The key is to just grill the lettuce halves for just a few minutes. I bet grilling your ingredients makes a Caesar salad something really out of the ordinary! I’ve got to try that next time! Yours looks so scrumptious, Jeanette! Georgia – this is a fun way to enjoy Caesar Salad – I used the smaller heads from Costco’s and they worked great. Alyssa – that sounds like the best summer dinner! What a nice twist on a traditional salad, I love grilling lettuce in the summer. I keep meaning to try grilling the romaine. This looks so light and fresh, perfect for a hot summer day. Grilled salads are the best. The dressing here looks fabulous. 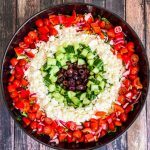 Sylvie, Carolyn and Shaina – this was my first time grilling salad – what a great way to mix things up!